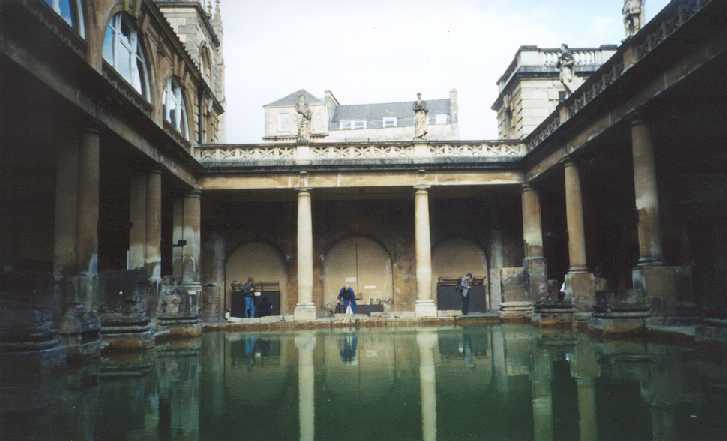 When the Romans invaded England in 43 AD, they found a small spa already in existence at Bath. However, they took it to the next level, building elaborate baths and temples here, dedicated to the supposed healing power of the hot springs. 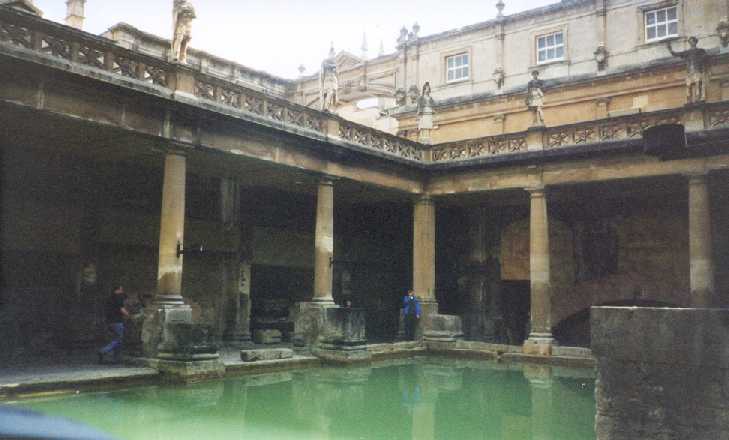 Some of what the Romans built remains today, providing the foundations on which modern day Bath is built. This is me in front of the Entrance to the Roman Baths. This a shot of the Great Bath from 100 AD ground level. This was the largest of the many baths the Romans built here. Here is another shot of the Great Bath from 1st century ground level, showing the statues put in place soon after the bath was rediscovered in Victorian times. The Romans would have had a roof over the bath, as opposed to it being open to the sky like it is now. This is a shot of the Great Bath from modern day street level. 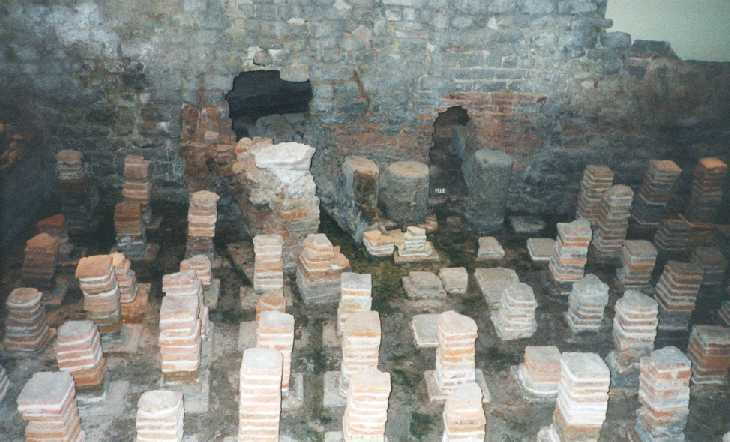 Over the centuries, the town of Bath was built up right on top of the Roman ruins. This bath was rediscovered in the 1800's when someone digging a well hit the bronze floor of the bath. This is a closeup of the Great Bath. The green water is due to the algae growing in the water. This is the hypocaust from the sauna adjacent to the Great Bath. Heated air from the hot spring was funneled under the floor which would have stood on these bricks. In this way, the room was heated. 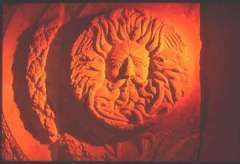 This is the face that decorated the facade of the main Roman building in this area. The building itself no longer stands, but enough of this facade has been found to determine that the Romans skillfully blended their Olympus based gods with the local Saxon gods. 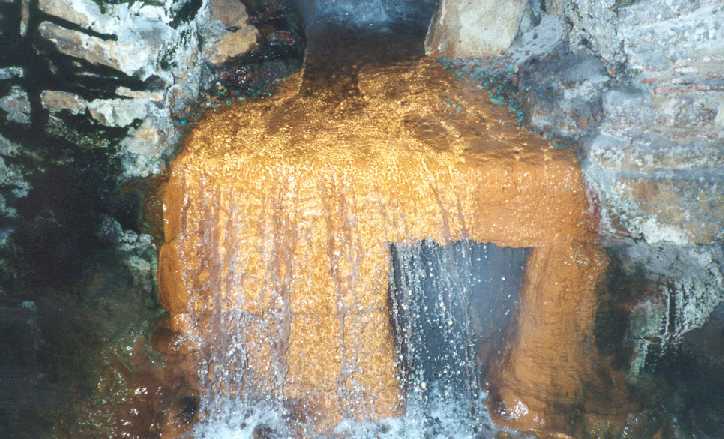 This is the entryway the Romans built to get the hot spring water into the complex, still working the way it was intended after almost 2000 years - the rust is from the high metal content of the water. This is the drain that takes the water out of the bath complex and back into the nearby Avon river. 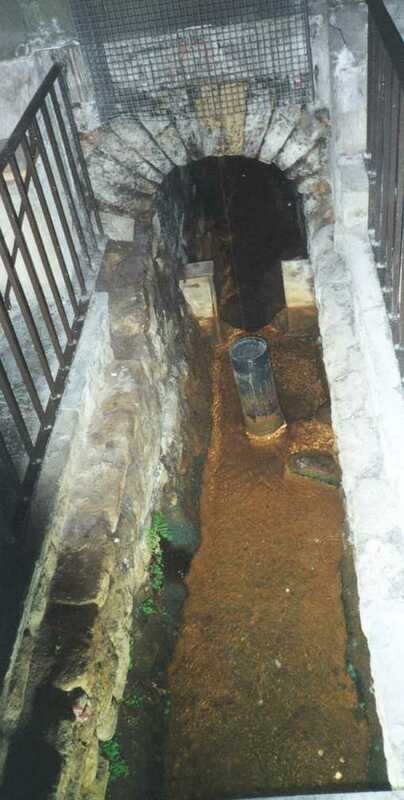 This drain was also built by the Romans and is also still in good working order after 2000 years. The cylinder in the water is used to measure the amount of water that passes by it. 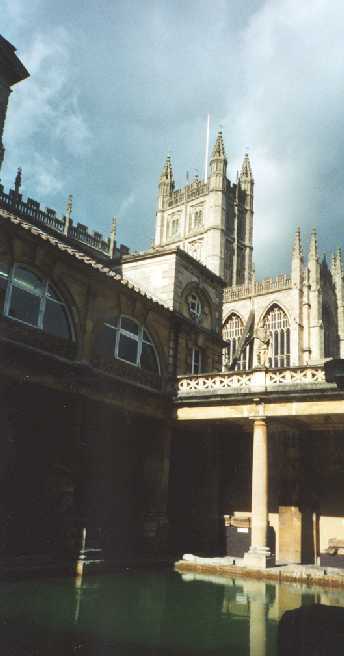 This view from the Great Bath shows the Bath Abbey, which is next door. 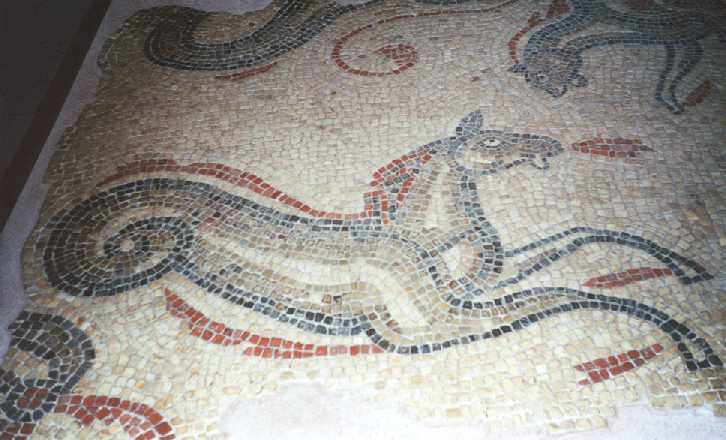 This mosaic was originally on the floor of one of the "locker room" areas of the baths. It is currently in the adjacent museum. 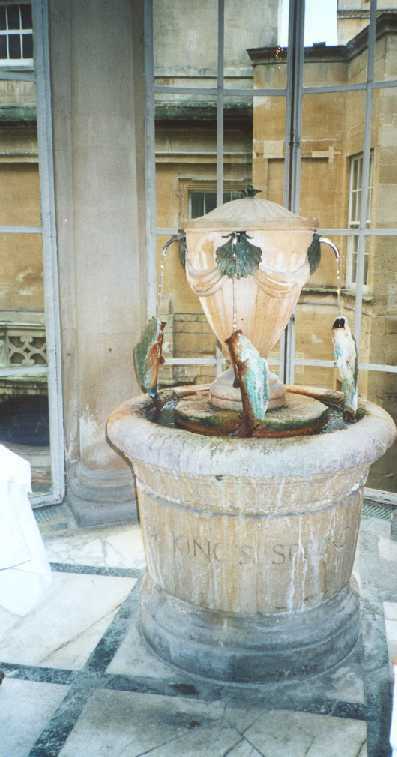 This is the fountain in the Pump Room, the 1700's resort and spa built on top of the Roman ruins. 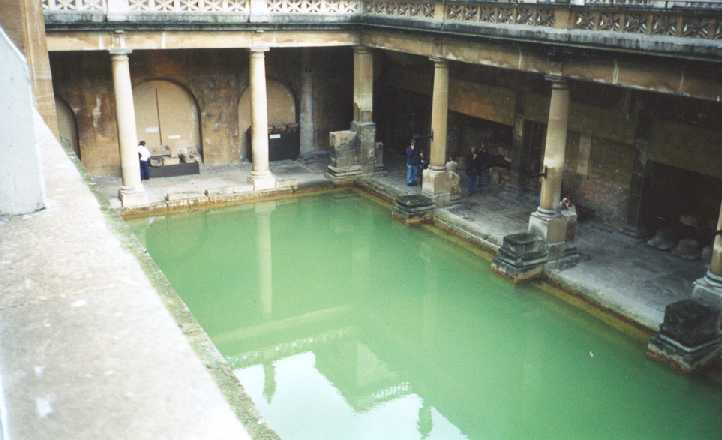 Georgian era British believed that the spring water had healing powers - doctors routinely prescribed Bath spring water for a variety of ailments. The fountain still dispenses spring water that is available for a small fee. My mom however is in a wheelchair, and they give it to "sick" people for free. How does it taste? I read on another site a description of it as "vile." That description works for me. Its very, very warm and so hard you almost have to chew it. Doctors used to prescribe gallons of the stuff per day. I'm not sure which is worse, typhus or 3 gallons of Bath spring water! This bronze head of Minerva came from a statue of one of the more unusual gods. Sulis Minerva had a Saxon first name and a Roman second name, demonstrating how the Romans merged their gods with the local deities. There was an elaborate temple to Sulis Minerva in Bath. Sulis Minerva had healing powers to Romans, on display in the museum are hundreds of handwritten and carved curses and requests that people threw into the baths as an offering to the goddess. 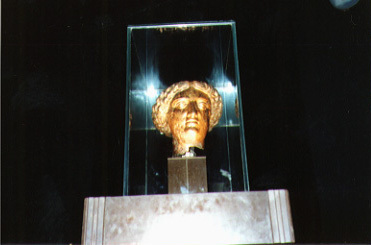 The head is in perfect condition and it is on display in the Roman Bath museum.